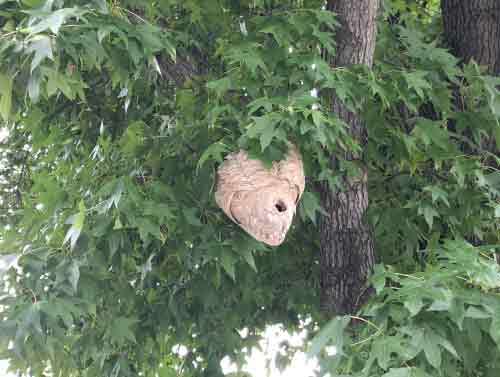 We offer Hornets Nest Removal Services in New York NY, Westchester County NY and Rockland County NY. We have the Know How to Get Rid of Hornets. Dont let hornets take over your property. Give Us A Call Today. 1-844-305-8999. We specialize in the removal of all Stinging Insects. The bald-faced hornet is a relative of the yellowjacket and gets its common name from its largely black color and mostly ivory white face. The thorax, legs and abdomen also have white markings. Queen bald-faced hornets are larger in size than their adult-worker counterparts. The queen and her offspring range in size from 13 mm to 20 mm – the queen is usually the largest yellowjacket in the colony. 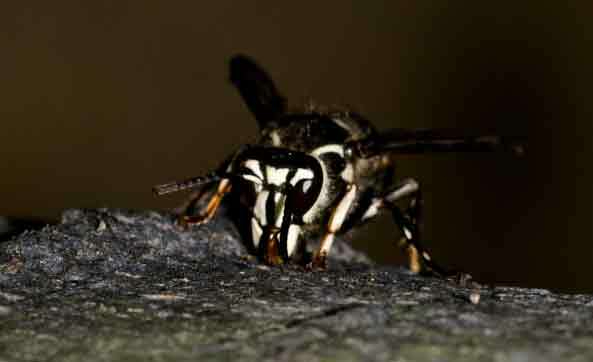 The bald-faced hornet causes little agricultural or structural damage. Yellow jackets and bald-faced hornets become very numerous towards the end of summer and may be persistent, unwelcome guests at picnics, where they scavenge for food. Baldfaced hornets are dangerous pests. An allergic reaction can occur from a baldfaced hornet sting that can be very severe and often requires medical attention. It is best to avoid all contact with these stinging insects. The European hornet, also called giant hornet or the brown hornet, gets its common name from its introduction from Europe into the New York area in the 1800s. European hornets are currently found in New York NY, Westchester County NY, Rockland County NY and in Orange County NY. 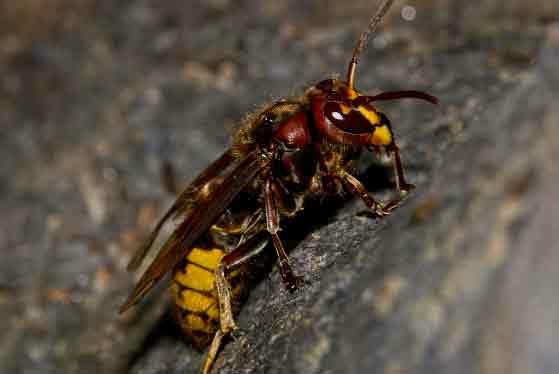 European hornets are much larger than yellowjackets and, unlike most stinging insects, can be active at night. European hornets are the only true hornets native to the U.S. 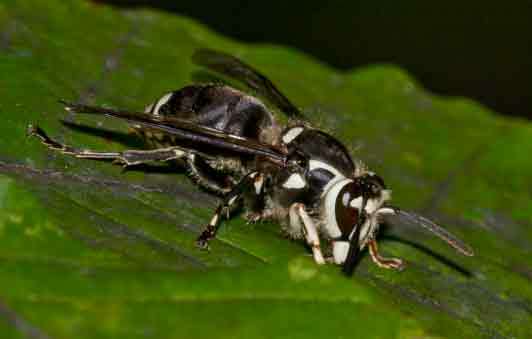 The bald-faced hornet, despite its name, is more closely related to the yellowjacket. European hornets can do a great deal of damage to trees and shrubs because they strip the bark to get to the sap. They also use the bark fiber to build their nests. A European hornet sting has the same risk of allergic reactions as with other insect stings. A Bald-Faced and European Hornet infestation is clearly visible with the presence of a nest, which would be suspended above the ground. There will also be worker bald-faced hornets flying around the nest and nearby area if there is an infestation. Their aerial nests are grey and paper-like, but they are enclosed unlike the open cone structure of other stinging hornets and insects, like yellowjackets and paper wasps. In the spring, fertilized queens that have overwintered in protected places such as in hollow trees, rock piles, under bark and in the walls and attics of buildings, become active and begin to build a nest. If you find a bald-faced hornet nest on your home or property, do not attempt to remove it on your own as this can aggravate the colony and cause the hornets to sting. Contact Dependable Exterminating for a proper Hornets Nest Removal to avoid the risk of bald-faced hornet stings. Our Stinging Insect professionals will likely examine the nest during the daytime, and then they will remove the nest at night when most of the hornets are in their shelter to maximize removal.